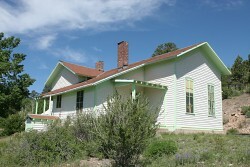 house, this one located at Sublette, CO?. A section house is "a facility, usually a single structure, that housed the MOW workers that were responsible for a particular section of a division - i.e. they made sure the bolts were tight, the bridges solid, the rails unkinked, etc. Along with the section house would usually be a speeder (or handcar) shed to facilitate such inspections and "light" repair."